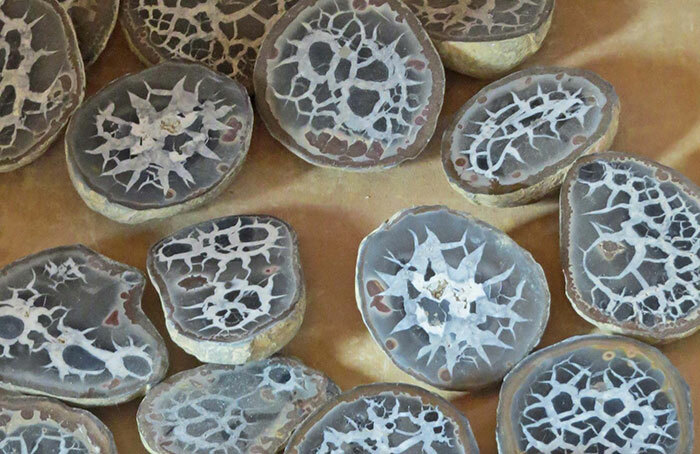 Septarian nodules are round concretions found in sedimentary rocks. 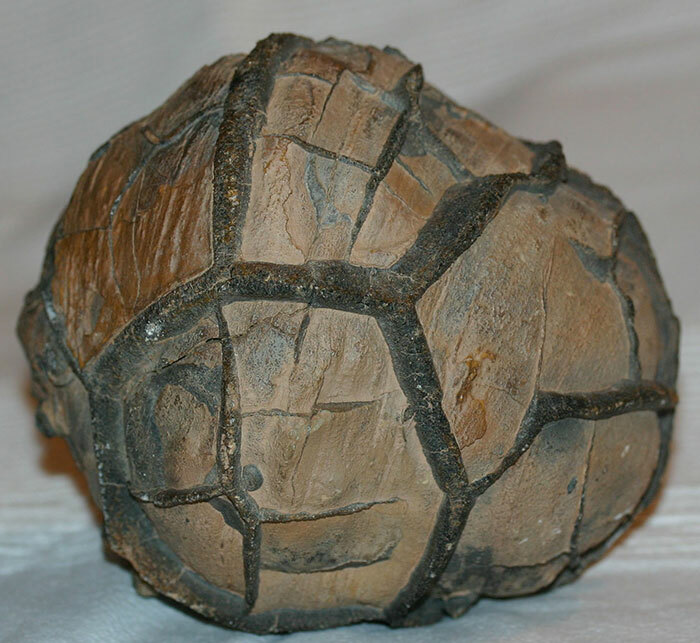 Concretions are hard solid masses formed by the accumulation of matter within sediment. Although scientists do not agree on the details and specifics of their formation, there are several theories. One proposal suggests they formed when there was dehydration and shrinkage of clay, gel, or organic cores within sedimentary pockets. Others believe there was an expansion of gases produced by the decay of organic matter that fractured material within sedimentary pockets. One more theory is that an earthquake, compaction, or other geologic forces fractured material within sedimentary pockets. 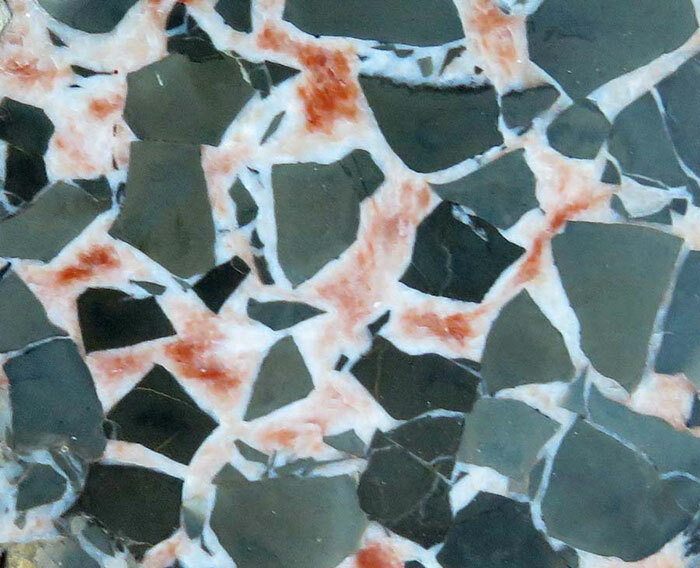 However the sedimentary material fractured, mineral-rich fluids filled in the spaces between the fractures allowing calcite, siderite, pyrite, and other minerals to crystalize and fill in the open areas within the cavity. The most well-known septarian nodules are found in Utah. The Utah septarians developed during the Cretaceous period between 50 and 70 million years ago. At this time the Gulf of Mexico had expanded northwest into the area that is now southern Utah. Scientists believe that volcanic eruptions killed marine organisms, causing them to sink to the bottom of the shallow sea. The decomposing material chemically attracted sediments causing the mixture to form into mud balls. When the ocean receded, the mud balls dried out causing the interior sections to crack and shrink. Over time, mineral-rich solutions infiltrated the cracks causing crystals to form and fill in the cracks. 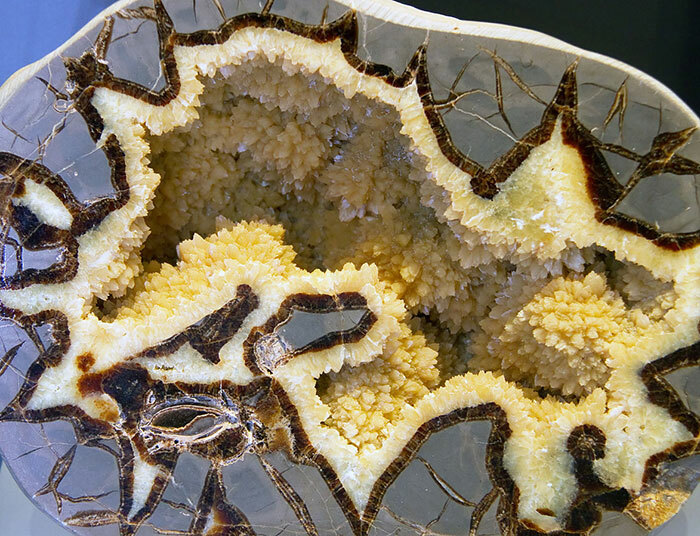 Septarian nodules, sometimes called lightning stones, can also found on the Lake Michigan shoreline as well as in New Zealand, England, Morocco, and Madagascar. 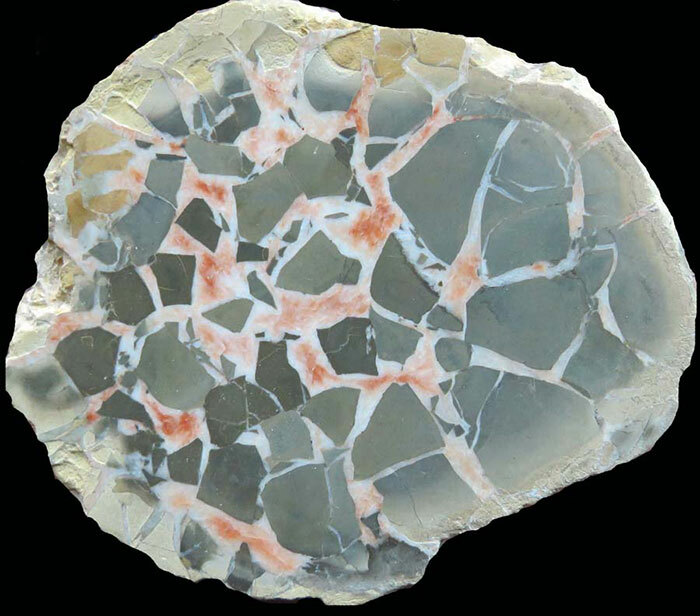 Septarians are composed of calcite (the yellow centers), aragonite (the brown lines), and limestone (the outer grey surface). Occasionally, fossils can be seen within or on the surface of the nodules.